The results of this star-studded venture are impressive. When the Studiodeck is set up on your rack an understated but sleek aesthetic is revealed. Measuring at a few ticks under 51x36cm and weighing 8.62kg, the ‘deck’ descriptor in the Studiodeck’s title is appropriate. Aluminium rules the day with a wide plate of the material bonded to MDF plywood to form the plinth of the table and the appears again in the 10’’ gimbaled bearing tone arm. The aluminium provides added mass dampening in the plinth and rigidity in the tonearm and judging by similar choices made in high dollar Spiral Groove tables are a good indication that Studiodeck’s design is coming from a higher plane of existence. The Studiodeck is run by a decoupled 300RPM AC motor and you will find a ¾’’ platter and pulley system made Delrin™ material. Delrin™ is a proprietary polymer material developed by the DuPont Corporation, the crystalline structure of which is thought by Mobile Fidelity to be ideal in effectively shielding the stylus from unwanted motor noise or vibration. If you were looking to reinforce your entry level turtable purchase decision, it doesn’t get much bigger than DuPont corporation, now does it? The Studiodeck’s inverted bearing is comprised of a combination of Teflon, steel, and bronze normally associated with more expensive tables that prize silent rotational stability. A packing note included with the Studiodeck remarks that some patience may be required over several hours as the platter and bearing find their synergy together, but to my ears there was no noticeable degradation of sound due to lack of a break in period. Mobile Fidelity rounds out your hard-working turntable expenditure with a set of anti-vibration feet designed by Harmonic Resolution Systems to further separate any unwanted vibrations from your playback. HRS is yet another highly thought of name in the industry that Mobile Fidelity enlisted to go ahead and get the Studiodeck right the first time around. 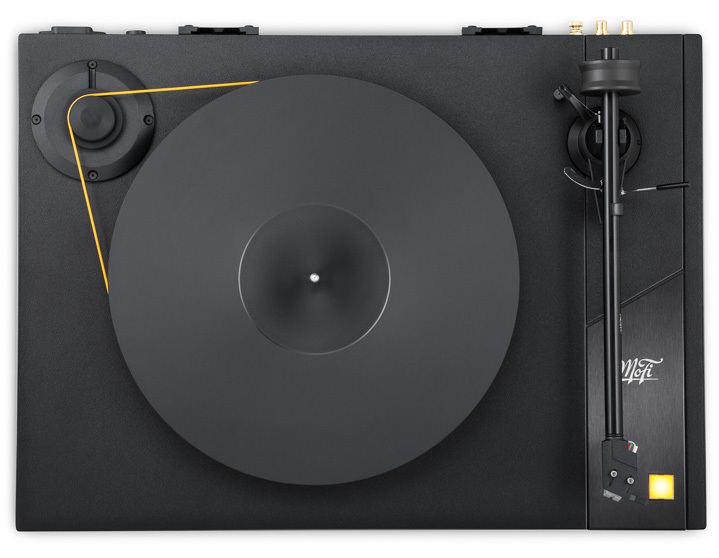 The build quality and feel clearly exceed most anything you are going to find at the £1,200 price point and coupled with the muted colours and included well-lined dust-cover the Studiodeck looks like it could easily be Darth Vader’s turntable of choice in the latest Star Wars flick. That is a compliment even if they were the bad guys; the Empire certainly had style, didn’t they? The sound produced by the Studiodeck would best be described as up close and personal. When it comes time for your first listen you had better just go ahead and buckle up tight and get ready because Studiodeck is ready to make some noise. My first vinyl audition with new equipment inevitably seems to be Mazzy Star’s mysterious third LP Among my Swan[Capitol] for good reason. Dropping the needle on the first track ‘Disappear’, you will hear a brief wash of sludge guitar swilling the bottom of the midrange that is quickly joined by chiming bells in the high frequencies that will often tell you everything you will need to know about how well your equipment will be able to organize sound. Playing ‘Disappear’ through the Studiodeck, the opening guitar had an extremely satisfying power punch and had me immediately trying to think of another table that I had heard that had such a forward leaning presentation. Listening to the Studiodeck you won’t be looking forward with your head pointed at the speakers, as I had been accustomed to doing with my Clearaudio Concept table via Cambridge Audio Azur 540a Integrated amp and ELAC Debut B6 loudspeakers. The Studiodeck seemed to be ready to do all the heavy lifting and was intent on delivering the sound right to my ears. The instruments were bursting with detail and the sound spilled into the listening room with a presence I was not expecting from an entry level table. Hope Sandoval’s haunting vocals were pleasantly crisp and clear as her voice jumped right out of the speakers, complemented by David Roback’s weighty guitar that was presented accurately with the feel of a heavy anchor descending to the bottom of the ocean. My Clearaudio Concept with the Concept MM cartridge had the edge for blacker background on this same piece of music, but the significantly less expensive Studiodeck performed admirably and kept Mazzy Star’s half-asleep half-awake vibe intact as I felt immersed in the music. After listening to Among my Swanit was clear that while the treble and bass were present and accounted for, it was well proportioned midrange that was the forte of the Studiodeck. It was time to pick up the pace and see what was possible when the Studiodeck was in its comfort zone. The Bar Kays 1976 runaway Funkenstien monster ‘Too Hot to Stop’ [Mercury] seemed to be an ideal choice to illuminate the rhythm, pace, and timing of a table that seemed to feel the need for speed. I hope someone already had the beer on ice because when the Bar Keys title track got its shot with the elliptical shaped moving magnet Studiotracker stylus the party was in full swing. The pure energy the Bar Kays radiated back in 1976 was mainlined right through Studiodeck and Studiotracker like defibrillator shocking me back to life. The electric pacing and timing the Studiodeck provided to the Bar Kays uptempo funk had me dancing before I even had time to take a seat on the way back to the couch after dropping the needle. The pounding drums, horns, and the wah wah guitar were crackling in a white-hot fire that was simply intoxicating. Entry level or not, the Studiodeck brought the pop and fizz across the board to my deep funk vinyl collection that had me greedily thinking about my next LP selection instead of what I might be missing out on with a more expensive turntable.